As I stated in the series intro my goal with this blog series was to help someone, somewhere move a step closer to developing their first module. I hope that the series has been useful for someone out there. It did take me a while to get all the material created, but I really pushed myself to have all the entries done before I even posted the first blog. I wanted to ensure a complete series and didn’t want to start something and not finish it so that I wouldn’t leave anyone hanging or frustrated. I want to remind you again that the way we just created a module is one of many ways that you can go about creating a module. There is no one right or wrong way to develop a module just as there is no one right or wrong way to eat a Reese’s. You can develop modules by starting from within DNN, you don’t have to use module development templates, you don’t have to use the services framework, and you can use some modules to build other modules. How you develop your modules is up to you and your development style. Also notable is that on my own I probably would have never finished this series. As the open source mentality would have it… I got some really good help and assistance along the way from several DNN Community members who have already traveled the module development path (many times) who are much more senior than me. A big thank you to Sanjay Mehrotra for helping trouble shoot and schooling me on things. Thanks to Will Strohl and Joe Brinkman for proofing material and providing insight along the way. Thanks to Shaun Walker for giving me additional insight and clarity into various aspects of module development. Without the assistance from these guys this series would have been dead in the water a few times. If you’re new to DNN let this be an illustration about the power of open source and the strength of the community. 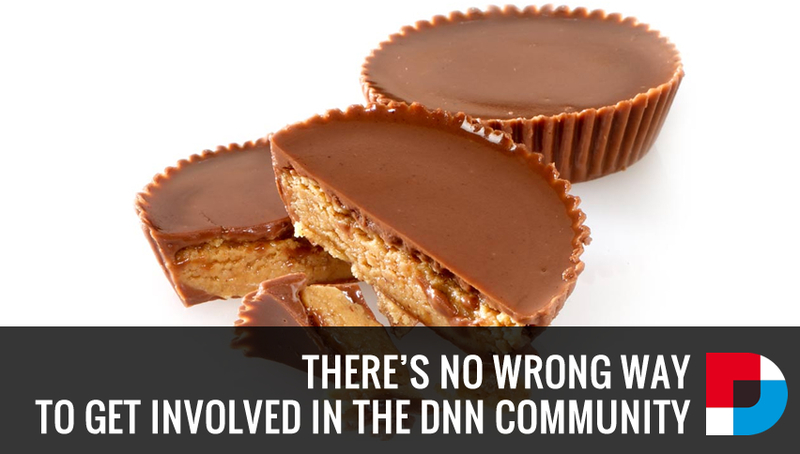 In the DNN Community everyone helps out. It may be proofreading a blog, contributing a skin or module, writing documentation, simply helping test extensions and providing feedback, joining a planning team, helping organize a user group, or answering forum and exchange posts. Whatever the contribution, everyone chips in where they can and collectively those contributions are powerful. There are many brilliant people in the DNN Community who freely give back and want to help out in some way. The notion of giving back and contributing from so many people around the world is one of the strengths of the DNN community and project. You are part of this community too! When I first started learning DNN the thought of developing a module seemed like a completely different universe away. And let’s be clear here… I am no module guru. I am learning. I say that to illustrate the fact that initially you do what you can or, as Joe Brinkman says, “start with what you have and scratch your own itch”. In my case, years ago, I knew initially that I couldn't develop a module, but I could definitely put some energy behind our user group and get people in the room who could develop modules (and then of course pay attention and ask questions). I also knew I could attend and organize conferences all the while learning more and more about DNN. In time I was speaking at user groups and conferences, but it didn't start out that way. Related Post from Ernst Peter Tamminga: You Are The One… Are You? I say all that to encourage you to get active, contribute, and participate. You are good at something, have knowledge in some area, or you are passionate about some subject. Whatever that is… blog about it, cut videos about it, answer questions on the forums or community exchange about it. You never know what you’ll learn or who you’ll meet. Are you a PHP dev who is now learning DNN? Well someone else out there will walk a similar path and they could benefit from you sharing your experiences. Are you in a new job where DNN is required, your insight is valuable. Regardless of the level or scenario your contribution is welcome and worth something to more people that you would imagine. If you do get active you will also benefit. From helping out with user groups and conferences I've met some really neat people with whom I’ developed friendships and … wait for it… nagged them to help me learn more. From doing this blog series I just learned a great deal and I believe that you too will benefit from participating in whatever avenue you choose within the DNN Community. You don’t have to be an expert to get involved either. I am a country boy from South Carolina who talks funny and is just thankful to have the internet. If I can contribute then I know you can… and in the long run you will benefit from your contributions! Did you learn anything in this series? If you just mentally answered “yes” to that question then my challenge to you is to give back to the community in your own way whatever that may be and whenever it may be. If you do, we all will be better because of it. Thank you for your time following this blog series. I hope it was helpful. I look forward to seeing you active in the DNN Community. See ya in the endzone! Is there a download link for the complete VS project? And everybody else: Clint is right: there is no wrong way to contribute. But please do! Tony, I've just updated this blog post to have a download link for the zip file of the module. Fantastic series, Clint! I especially appreciated the jQuery approach. Changed it to use KnockoutJS w/out any problems! Looking forward to making my own working module soon. Thanks again! Thanks Ralph! Glad to hear that the series was useful for you. I look forward to seeing your module in action! Thank you very much Clint! The best intro into DNN Develop !! Thank you Clint. An excellent ride through 22 in depth and interesting tutorial. I've learned a lot. I was going to switch over to Umbraco but you've made me change my mind. I can see myself using DNN in future development projects. I can see myself coming back here as a refresher from time to time. Thank you again. Outstanding blog and video series Clint! I'm one of those someone's you were trying to help make their first module. With your help, I made it all the way to the finished module and I'm super excited about it! I've been cobbling forms and reports modules together on overloaded pages to get some interactivity on my data-centered sites. The ability to make my own module was out of my reach until your blog series. I have a number of uses in mind for my next few home-made modules already. Thanks again for sharing your knowledge. Great series...even for a seasoned developer. It fills in the gaps. Thanks for putting it together.